As with all Feat-book by Abandoned Arts, we get 3 pages – 1 page front cover, 1 page SRD, 1 page content, his time dealing with ranged combat, so let’s take a look! Arced Shots: When in an area with enough vertical space, you may ignore 2 points of cover when using your bow by firing an arcing sot. Neat! Easy Draw: Draw your bow with one hand. If you wield a melee weapon in one hand, you need to be proficient with it to make use of the feat, but can’t attack with both. Hair Trigger (Grit): When wielding your firearm, you gain + 1/2 grit you still have as a bonus to initiative. Heaving Throw: When using two hand to throw a weapon, you reduce the distance penalties beyond the first increment by 1 ad gain a +1 bonus to damage for every increment the foe is away. Nice imagery! Marksman’s Eye: Ignore the first 10 feet of distance for every point of BAB you have when calculating distance penalties of perception checks. Simple, elegant, cool! Piercing Shot: When using a composite bow and missing your target, compare results of the attack with touch AC If you hit touch AC, you still deal str-mod damage to the foe, though for all intents and purposes the shot is still considered a miss. Cool feat to whittle down those tanks! Two thumbs up! Rayslinger: When casting a ray-spell, you get a +8 dodge-bonus vs. AoOs incurred by casting the ray. Again, neat! Reach for the Sky (Grit): When reloading your firearm, as long as you have a point of Grit left, you may demoralize opponents within 30 foot as part of your reloading. Shootist’s Showmanship: When making a perform check as a swift action, you may also holster, sheathe or draw your crossbow or firearm as part of that action. Sniper’s Shot: When using deadly aim versus an opponent unaware of your location, you may ignore the penalties associated with using said feat. Editing and formatting are very good, I didn’t notice any glitches that impeded my understanding of the feats. Layout adheres to Abandoned Art’s no-frills two-column standard and the pdf has no bookmarks, but needs none at this length. This pdf provides us with a nice, humble array of feats, with especially piercing shot being one of the feats that can be considered a boon (or bane, depending on your end of the shot). All in all, I have no complaints regarding the material presented herein and at the low price, I’d consider buying his worthwhile for Piercing Shot alone – at least if you’re like me and have a player who wants to play an Armiger and want an ace up your sleeve… My final verdict will be 5 stars. This installment of the Fehr’s Ethnology-series from Purple Duck Games is 11 pages long, 1 page SRD, 1 page advertisement and combined logo/editorial/etc 1/2 a page, leaving us with approximately 8.5 pages of content, so let’s check these out! The Zendiqi, as becomes readily apparent from the short, aptly-written fluffy introduction, are a sub-breed of humans influenced by their very distinct culture: The Zendiqi were actually the native population of the now-patchwork-world Porphyra before the NewGod-war that forever changed the setting. Culturally, they are atheists worshipping the elemental forces and fighting against the agents of the divine ad the incursions of the humanoids that have invaded and conquered and forever changed their lands. Zendiqi get + 2 to an ability-score of their choice, + 1 to atk vs. gnomes and dwarves, +4 on con-checks and fort-saves to avoid fatigue, exhaustion and ill effects from environments, running, forced marches, starvation and thirst, +2 to AC and grapple checks vs. divine spellcasters, can detect the auras of divine spellcasters as per detect evil/good/law/chaos, +2 to saves vs. divine spells and apply -2 per character level to healing gained by positive or negative energy and gain resistance 5 against a chosen element. The race comes with full age, height and weight tables and 4 race traits for improved bone weapon handling, camel-riding, +1 to confirm crits and damage on crits and access to knowledge religion as a class skill and +1 to it. They also get 6 different alternate racial characteristics to make Zendiqi abandon their philosophy, a trait that helps sorcerers of specific bloodlines, +1 to disable device check and knowledge (engineering)-check, traits that allow the Zendiqi to focus their racial hatred towards elves or green-skins instead of the short folk as well as a characteristic that allows for more accepting Zendiqi that seek a path of acceptance. There also are new feats for Zendiqi: One that allows the race to improve its resistance against elements, one that gets rid of bone-weapon drawbacks and improves intimidation, a feat for a devastating mounted charge, a dervish-feat that lets you add dex-mod to atk and damage when 1-hand-wielding scimitars, more resistance vs. the desert and the ability to heal yourself via godless meditation techniques. The feats also include a 3-feat mini-feat tree based on the sidewinder style feat, which increases the reach of your 5-foot-step to 10 feet and allow the practitioner to kick up dirt and sand to get +1 to AC and impose -1 to hit on opponents. The style also grants 1/2 class-level to bluff and improves your feinting capabilities and finally also dealing 1 point of dex-damage vs. feinted opponents. After these rules, we are introduced to the race’s take on the respective classes, favoured class options for alchemists, barbarians, cavaliers, fighters, sorcerers and wizards as well as two new class options: The wildblooded Malahna Bloodline, that changed the elemental sorcerer bloodline by replacing elemental resistance and allows the sorcerer to emit rays that damage aura-bearing characters and heals non-aura-bearing casters. There also is a new cavalier-order herein, the order of the Sirocco, which represents the camel-riding elite chargers of the Zendiqi. We also get a sample level 1 fighter. Editing and formatting are very good, I didn’t notice any significant glitches. Layout adheres to a 2-column standard that is generally printer-friendly and the 1-page artwork of the Zendiqi is awesome. The pdf is fully bookmarked with nested bookmarks. 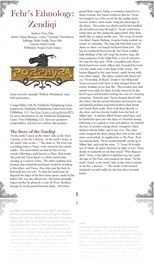 The fluff, the abilities, the well-balanced unique racial feats – while entwined with the background of Porphyra, are simply awesome and could easily be transported to other settings. let me spell it out: The unique culture of the Zendiqi hinted at in this book actually makes me SO want to include these interesting xenophobic beings with their ideologies and struggles into my game and that is something that only very rarely happens. Balancing between being easy to insert and unique, this is one of the very best installments of the series so far and gains my full recommendation at 5 stars + seal of approval. 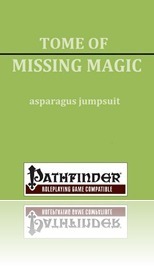 This pdf from Asparagus Jumpsuit is 96 pages long, 1 page SRD/editorial, leaving us with 95 pages of content, so let’s check this out! This pdf, sans frills etc., seeks to reproduce items from older editions and update them to PFRPG , including feats to make potions of higher levels and wands of higher levels (via a total of 4 feats). Without any ado, the pdf delves right into tables – a lot of tables, allowing you to make unbalanced treasure hoards via rolls of d%s: We get monetary treasures, magic treasures, items, potions, scrolls, scrolls of spells of wizards and clerics by level, 5 tables in miscellaneous items, rings, etc., ranged weapon abilities etc. pp. After about 10 pages of such tables, we delve into the descriptions of potions, which include ones of bear’s endurance, alter self etc. as well as potions that allow you dominate e.g. any type of dragon as per the dominate monster spell for 17 rounds. Sample scrolls of baleful polymorph etc. 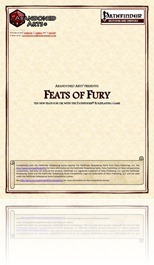 are included, but that’s where the problems creep in: This pdf provides a lot of potions, scrolls etc. that can be created via the standard rules as well as e.g. items like rings of confusion etc. – all coming with solid statblocks, creation rules, auras etc., including entries that point towards the core-rules for e.g. rods of lordly might. Per se, this pdf’s massive collection of expertly presented items could be considered a nice professional offering, but honestly, the problem is that the items herein can be made by any DM worth his/her salt – no one needs these scrolls and potions, they can be created easily. The item-section could be considered an collection of them like the AD&D encyclopaedias of old – but by now, we have the APG, UM and UC – all of which are utterly ignored, with all the rules introduced by them. Now yes, if you’re like me, this pdf tugs at your heart’s strings with phylacteries of eternal youth, ropes of entanglement and especially the artefact section, but more on that later. Manuals for all attributes get a d%-table to determine their bonuses. Old-school, yes, but do we really need this? The artefacts especially are a blast from the past, coming with advice and sample DCs for knowledge checks to know about their past. And oh boy, is this nostalgia tugging at the heart’s strings – whether it’s the arch-lich’s hand and eye or a staff made of 7 component parts – this pdf essentially provides you with the IP-free versions of artefacts like Vecna’s Hand and Eye or the Rod of 7 Parts and mechanically, they actually aren’t bad and come with nice consequences and means of destruction. They are well-made. Seriously. We also get tables of e.g. banded mails from +1 to +5 with price, cost to create, total bonuses, max dex-bonuses etc., also in special materials – again, in tables upon tables, including modifications of e.g. mithral or adamantine, darkwood or dragonhide. Special weapon qualities (though called “templates”, which is an incorrect term in PFRPG) are also displayed, e.g. providing the cost etc. stats for a general axiomatic melee weapon +2. And yes, these weapons may again have the benefit of being ready-made for your convenience, but again: Every Dm could create them him/herself. The final section of this pdf is devoted to types of ammunition, including e.g. shocking burst +2 ammunition. Editing and formatting are very good, bordering on excellent: I noticed no significant glitch over a pdf this long and the general presentation of the items adheres to all the conventions of PFRPG. Nice display of professionalism there. Layout adheres to a no-fills, 2-column standard with light green and orange used to highlight the respective item entries/table-entries, making the pdf generally rather printer-friendly – were it not for all the entries that only consist of the item’s name and a sentence pointing towards the core-book. Were the respective pointers towards other books also included, this would make sense – with the focus on just the core rules, though, this means that the entries only empty toner/ink-cartridges without contributing anything. Hyperlinks to d20pfsrd.com would have gone a long way there. Another major downer is the omission of bookmarks – at this length, they are not optional, but obligatory and searching for the right table in this pdf is without them an unnecessary chore. The pdf is small, though, which is neat indeed. That being said, while at first the pdf may seem amateurish and its overall formal presentation surely is, it does a lot right: Adhering to PFRPG-standards in wording and formatting, item-blocks etc. I’ll come clear with you: Reviewing this pdf was a colossal pain that took me forever, including checking many of the item’s math and from what I could glean, they are correct, meaning that A LOT of work has gone into this pdf. The artefacts and their tugging of one’s nostalgic heart’s strings also means that grognards will probably find a collection of items that will have them smile. In the end, a massive problem I have with this pdf is how to rate this: On the one hand, evidently a vast amount of work has gone into the creation of this pdf and generally, the result can be considered professionally appealing. On the other hand, the lack of bookmarks and artworks hurt this pdf when combined with one factor: The price. $14.00. Seriously? For this price, I can have a Paizo-module in print. Headless Hydra Games’ Mor Aldenn city setting comes with artworks, maps etc. and costs less. And just about all other 3pps have a better bang-for-buck-ratio. And there’s another problem: The lack of creativity. Much like academic writing and writing in general, game design is both an art and a craft – craft-wise, this pdf is devoid of flaws regarding the crunch, but it is also utterly artless. There’s no soul, no creativity herein. This pdf, for me, at once was nostalgic and terribly, utterly dreary to review. I couldn’t find a single piece of creative spark, of soul in these pages. Much like a Sepia-tinged photo of an unremarkable day (in contrast to e.g. a wedding or cherished childhood day) gone by, this pdf elicits feelings of nostalgia and can be considered useful, but fails to truly evoke an emotional response or excitement. It signifies towards a nostalgia, but offers not much soul beyond that, remaining a solid example of crafting, but much like something produced in a factory, it lacks the charm of e.g. a work of the “Arts & Craft”-movement. In the end, whether this is a good purchase for you depends utterly on how lazy you are as a DM and whether you can live with the lack of bookmarks and artless presentation. If you can and are willing to pay the high price, this could be considered a time-saver and even a 3-star file. Now if you’re looking for originality, soul and innovation beyond what to me feels like hollow nostalgic pandering, then this pdf will disappoint you as much as it did disappoint me. Personally, for me this was both a chore to read and due to the lack of bookmarks and lack of innovation not a book I will use and rather be a 1-star, overpriced pdf. My final verdict will be in-between both extremes, at a 2.5 stars – which I’ll round down to 2 since at 14 bucks, not getting any bookmarks is downright insulting, no matter how good a book is – and yes, I stand by this verdict even with regards to the target audience. This installment of Dreadfox Games‘ Grimoire-series is 33 pages long, 1 page front cover, 1 page editorial, 1 page SRD, leaving us with 30 pages of content, so let’s check out their take on abjuration-spells! After about 7 pages of spell-lists by character-classes, we delve into the respective spells, kicking of with the Aegis of Energy-spell, which adds temporary hit points to curing effects via positive or negative energy effects. The very second spell this pdf offers, Aerial Mantle, makes AoOs automatically miss the target and depending on the strength of the wind surrounding the target, have their attacks rebounded on them with a bonus depending on wind strength. Druids get an significantly-enhanced spell duration, which is nice. What isn’t nice at all is that the spell is essentially ruined by the fact that it does not specify whether it needs aforementioned, at least “strong” winds, to work at all or whether it conjures the storm winds up as a partial effect of the casting. In the end, we don’t know and in my humble opinion, such a limiting factor would be necessary, since without it an auto-miss for ALL AoOs is overpowered. Rather interesting and cool is Arcane Gravity: A spell that lets you temporarily seal whole spell-levels off: If you chose to e.g. seal of level 3, you can’t cast level 1, 2 or 3 spells. As a trade-off, your effective HD for purposes of spells like cloudkill etc., is increased by the value of the highest spell-level you chose to seal off. VERY cool! Not so cool: Axis of Resistance: The subject’s SR is increased by +2 for every source of SR he/she/it has in excess of 1. Stacking SR via a spell, even if it is such a minor stacking, is a design-decision I can’t really get behind. While probably at the top-most a bonus of +6 or 8 will be achieved, it’s a typical powergaming-enhancing type of design. Corpus Examinus is a witch-spell of unique iconicity and ranks among the best I’ve seen in a while: It allows you to painlessly sever parts of your body to control them as separated entities with Hp you determine, abilities depending on the body part you chose to extract. A table e.g. lists options to use evil eye via extracted eyes etc. Better yet: The options of regeneration etc. and the interaction with the spell are taken into account. Unfortunately, there are also problematic spells: The cantrip (elven) sobriety eliminates the effects of alcohol. I’ve seen that one before, in Rite Publishing’s 101 0-level spells, and I already hated the idea there – an end of the hangover plots, of drinking contests and a major detriment to grittiness and the results of alcohol consumption. Violent drunken guy heading your way? Just cantrip him! An ok idea with problematic repercussions for a campaign-world’s internal logic. Field of Disintegration, on the other hand, is rather smart: You conjure a field that is very detrimental towards weapons that hit it, resulting in a lot of broken weapons and damage for those employing natural weapons – but before you start screaming unbalanced: With some sharpening after combat, the negative effects of this spell can actually be negated, which is rather neat! Hand of Rescue would be another winner: Reducing the weight of the target creature, it even allows you to potentially throw the respective character a short distance, acting as a crunchy representation of the iconic rescuing catch of an almost-plunging-to-death-comrade. Luminore’s Refractive Shell would be another interesting spell that eliminates invisibility and blurring effects in a small area, but cannot be used offensively – interesting, clever, neat! There also are two rather nice spells that allow you to create a reservoir of positive or negative energy respectively, acting as a kind of limited battery of the energy by foregoing healing by the energy. Repel Malignancy makes for yet another interesting idea, creating an impassable barrier that cannot be crossed by anyone who uttered any negative word to you in the last 24 hours, even if the words were meant as a form of criticism. There is also an interesting ritual herein, like the antipaladin’s royal impunity, which sacrifices a virgin over 12 hours and sells one’s soul to a fiend, but grants immunity to infernal powers exerted by non-noble fiends. Two spells also are interesting in that their respective powers are tied to the time of the day, which is interesting, even though it requires some tracking on the player’s part. There also are spells in here to suppress magical traps temporarily and a smart capstone level 9 druid-spell that makes one transmutation film essentially impossible to dispel, but inflicting damage on you if the spell in question would otherwise be dispelled. Speaking of cool interaction with transmutation: There’s also a spell that potentially adds harmless transmutation effects to other creatures beyond the primary target. Editing and formatting are top-notch, I didn’t notice any significant glitches. layout adheres to Dreadfox Games’ two-column standard with its thorny borders and parchment-style background. There are no artworks herein, but the pdf is extensively bookmarked. This collection of abjuration spells is interesting once again – displaying DFG’s creativity with far-out spell concepts, the content herein is often bold in mechanics and imaginative in design. 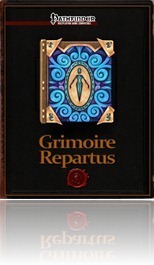 Not always, though: Some spells, as with many of the Grimoire-books, are variations of already existing ones. And in others, creativity backfires and can potentially create logic bugs in your setting – handling these with care is of tantamount importance. That being said, the majority of the content herein is interesting and should enrich a spellcaster’s arsenal or a DM’s creative arsenal to use and spin tales from. While not reaching the peak of genius of Grimoire Mutamateria or Grimoire Illusionatus, this pdf is actually one of the better installments of the series. Thus, I’ll remain with a final verdict of 4 stars and a recommendation to everyone who is looking for some truly different abjurations. You know the drill – Abandoned Arts, 3 pages, 1 page front cover, 1 page SRD, 1 page content, leaving us with 1 page for feats of Intellect, so let’s check them out! Combat Advisor: You don’t need to threaten a foe to use aid another – being within 20 ft. is enough. Allies have to be able to hear you, though. Insightful Aid: Use your Int-modifier instead of the regular +2 when using aid another to grant an ally a bonus to AC or atk. Nice! Moment of Genius: When taking 20 on a skill-check or rolling a natural 20 on it, you gain your int-modifier as a bonus. A godsend for wizards needing to climb that cliff. Nemesis: When using knowledge skills to recall information on a being, you also recall one additional vulnerability or weakness per information unearthed. Per se an ok fat, but too generic for my tastes. I prefer research (à la Anachronistic Adventurers: The Investigator) and "puzzle-foes" in my home-game. Your mileage may vary, however. Presence of Mind: Add your Int-modifier to Sense Motive to gain a hunch about social situations or detect lies. Ok, I guess, though I’m not a fan of adding second attribute modifiers to skills – the buses tend to spiral out of proportion. Psychological Warfare: Interrogate another person in 1d3 hours. You get a +6 bonus to intimidate versus said person and the target is afterwards fatigued. Rather cool – I can see my PCs using this one. Intellectual Stamina: Reduce drain or damage to mental attributes by 1. Street Smarts: Now here’s one for investigation-heavy campaigns that often feature a time-limit (like mine): When taking 20 to gather information via diplomacy, you only take 3 a long as a check not 20 times as long. Neato! Tactical Brilliance: Roy of Oots would be so proud. At the start of combat (first round or surprise round), you may as a free action devise a tactical plan that grants your allies your Int-modifier to damage versus foes that have not yet acted. Also features a typo where "his" should read "your" that makes the feat at first a bit harder to grasp than it ought to be. Tricky Manoeuvres: Add your Int-bonus to manoeuvres vs. foes denied their dex-bonus to AC versus you. Editing and formatting are good, though I noticed one typo that slightly detracted from readability. Layout adheres to Abandoned Art’s no-frills two-column standard and the pdf has no bookmarks, but needs none at this length. The collection of feats of intellect is solid and offers some nice flavourful new options. Nemesis, though, feels much too generic for me and overall, this installment lacked a feat that really blew me away like channelled rage in Feats of Fury did, for example. Thus, I’ll settle on a final verdict of a solid 4 stars. All right, you know the drill by now – Abandoned Arts, 3 pages, 1 front cover, 1 SRD, 1 content, this time giving us 10 Fury-themed feats, so let’s take a look! Bloodlust: Gain a moral bonus to melee atk and damage vs. undamaged opponents equal to your will-save. Cool feat, especially to mop up wak foes. Brawling Opportunist: +1 AoO per round, which must be unarmed, but does not require you to have a free weapon. Also, unarmed AoOs are never offhand for you. Neat! Channelled Rage: Now we’re talking! Creatures with the Rage-quality that are affected by your channelled energy can enter a rage as an immediate action and ge their first round of rage "free". Similarly, those already in rage get a free round of rage upon your channelling that does not count vs. their daily maximum. Very cool feat of class ability synergies and teamwork – Two thumbs up! Demolishing Charge: Add your atk to Str-checks and damage when charging unattended objects. Essentially the Juggernaut-feat. Neat! Focused Rage: Your AC-penalty when raging do not apply to the first foe hit in your first round of rage. Furthermore, it does not apply vs. the first enemy hit in a moment of clarity. Ok, I guess. Grudge-Bearer: When damaged by a foe against who you have a racial bonus to atk, you gain half the damage received as a bonus to weapon damage on the next attack vs that foe. Cool in that it makes racial foe-bonuses still significant at higher levels. Infuriating Combatant: When making a combat manoeuvre vs. a foe, you may use the intimidate-function of your Antagonize-feat as a move-action as long as you do so before the end of your next turn. Again, neat feat! Raging Lunacy: While raging, you may opt to not apply your wis-mod to will-saving throws while raging. Cool especially for DMs wanting to portray frothing, raging madmen. Racous Spell (Metamagic): +1 spell-level. Your spellcasting imposes a penalty equal to the spell’s level on perception and concentration-checks as long as the spell persists. Concentration-checks to cast language-dependant spells take double the penalty. Rebellious Will: When successfully making a will-save vs. an opponent’s spell or effect, you gain a +1 stacking bonus against will-saves against the effect that prompted it for one hour, regardless of source. The effect stacks with itself and all other effects. This one could be a tad bit more powerful for my tastes. Editing and formatting are very good, I only noticed minor glitches like "rage" in lowcaps. Layout adheres to Abandoned Art’s no-frills, two column standard and the pdf has no bookmarks, but needs none at this length. Neat! For the first time in Abandoned Art’s feat-line, I get a pdf where I have nothing significant to complain about and indeed, channelled rage alone as a feat is, at least imho, worth the low asking price. Do your barbarian a favour and pick this cheap pdf up – chances are you won’t regret it! My final verdict? 5 stars, falling only marginally sort of the seal of approval. Well done! 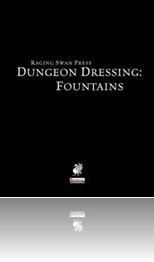 This installment of the Dungeon Dressing-line from Raging Swan Press is 13 pages long, 1 page front cover, 2 pages editorial, 1 page ToC/foreword, 1 page SRD, 1 page advertisement, 1 page back cover, leaving us with 6 pages of content, so let’s check this out! In tradition with RSP’s Dungeon Dressing-line, this pdf kicks off with characteristics & appearances, covering this time 9 different generic subjects, 8 general properties of the water and we also get 6 samples of poisoned/diseased water as well as 6 different magical properties before we even delve into the table containing the different characteristics and include completely off-kilter (in a positive way!) fountains – irregular waterjets, forceful bursts of H2O etc. – gold! The dressing and feature-table is also a joy to behold, providing 100 (no roll twice/thrice wasted entries!) characteristics that include hidden cryptic messages scrawled into basins, disguised cave scorpions, weird liquids and algae. Neat list! And then, we get the Traps & Tricks-section – and boy, author Ben Armitage has delivered! Take a stone-tree-fountain with shifting stepping stones and acorns containing searing clouds as well as scything branches – multi-round fun and oh so awesome! Or take a fountain that releases skeletons, attacks with animated chains and seeks to drown PCs in now erupting green slime! 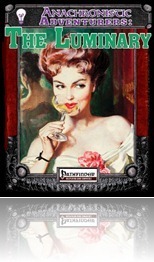 Devilish, diabolical, awesome! The final fountain, while also dangerous, can provide interesting insights – and would make for a great lead-in to PDG’s “Through the Cotillion of Hours”, if you seek to convert that one to PFRPG. Editing and formatting are top-notch, as I’ve come to expect from Raging Swan Press. Layout adheres to RSP’s 2-column standard and the pdf comes fully bookmarked and with two versions, one optimized for the printer and one for tablet-use. The tables are glorious this time around and the traps are so iconic, they almost warrant the low asking price alone. HOWEVER: Where is the fountain of blood? Of Acid? Lava? Liquid lightning? Plasma? You know, UNCOMMON liquids? None in here, which is the ONE gripe I have against what would otherwise be 5 stars + seal of approval.Due to the lack of cool liquids, I’ll have to settle for a verdict of 4 stars instead. Much like the other installments of Dungeon Dressing, this pdf kicks off with useful rules-information compiled for the DM’s ease of reference: From Perception-check-DC-modifications to locks and their DC to sample stats for doors, we get a nice slew of useful pieces of information, including stats for beaded curtains, bone doors as well as 5 conditions that modify the stats provided for the respective doors, including str-check DCs, HP etc. After this page of useful information, we’re off to the first table, in which we are introduced to varied characteristics to make your doors more interesting, ranging from being handle-less to being trapped. A to a of 98 different dressings and cosmetic details are also provided for varying doors, with 99 being the roll-twice entry and 100 indicating a trap. Speaking of traps – we also get a couple of sample traps, spanning CRs 3 to 11 and including multiple variants of the poison needle-trap – said variants mention e.g. purple worm poison, but don’t provide the effects, making the entry slightly less comfortable to use than I’m used to by the supremely organized pdfs of Raging Swan. The pdf also lists common magical defences via symbols, but again, while we get CR etc., shortened effects would have been nice, if only for convenience’s sake. Plus: I’ve seen l these traps done before. Editing and formatting, as almost always with Raging Swan Press, is top-notch and beyond reproach. Layout adheres to S’s elegant 2-column standard and the pdf comes in two versions, one optimized for e-readers and one to be printed out. The pdfs are extensively bookmarked. 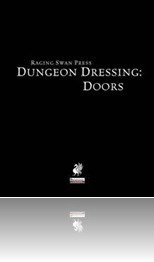 Author Jeff Erwin provides us with interesting dungeon dressings for doors, but when contrasted to “So what’s the Mount like, anyways” or other Dungeon Dressings, I can’t help but feel as if the pdf has its focus slightly askew. The traps, while nice, are simply not that exciting and take up too much space – space that could have been used for other things – like handles, hinges, fortifications, more things with rules-modifications to modify doors etc. Don’t get me wrong, there is per se nothing wrong with this pdf, it just isn’t up to the insane standard the series has set itself and could have used a tighter focus – or more interesting traps. Thus, while there is nothing wrong per se with this pdf, I feel I can’t go higher than 3.5 stars on it, rounded down to 3 for the purpose of this platform. You know the drill – 3 pages, 1 page front cover, 1 page SRD, 1 content for 12 new substitutes for trapfinding and from Super Genius Games, so let’s check them out! Black Marketeer: +1/2 level to appraise, + level to percentile of price you get when selling. Chink in the Armor: !7day, when sneak damage is negated (by e.g. fortification), as a swift action deal half damage anyways. Usable additional times at higher levels. Climb Walls: +1/3 level to climb checks, need only one hand to climb and not lose dex when climbing. Harass: For each sneak attack dice you choose not to deal, impose a -1 penalty to atk, CMB, ability, concentration or skill-checks for one round. Hoodwink: +1/2 level to bluff-checks, option to fool magic effects that determine truthful answers. Ki Pool: Gain a ki-pool like a ninja and as long as you have at least 1, treat all acrobatics-checks like a running start. Pick your Way: +1/2 level to acrobatics, don’t treat crowds as difficult terrain. Trapmaker: +1/2 level to craft (trapmaking) and make traps that are harder to spot. Option to learn ranger traps at higher levels and gain more via talents. Turn the Knife: Deal +1 damage per sneak attack die versus foes denied their dex-bonus. Street Tough: Gain proficiency with all martial weapons. Sacrificial Blow: 1/day add sneak attack to an attack that wouldn’t count as sneak attack at the cost of provoking AoOs from all threatening creatures. Can be used more often at higher levels. Editing and formatting is top-notch, I didn’t notice any glitches. Layout adheres to SGG’s 3-column landscape standard and the pdf has no bookmarks, but needs none at this length. 12 options to replace the vital trapfinding make for difficult choices and indeed, they feel balanced, though some are obviously suited better for certain play-styles (Black Marketeer making e.g. only sense when the PCs don’t swim in money…), while certain ones, at least in my humble opinion, might be especially useful for NPCs or mostly useful in urban settings, I can’t fault the pdf for that. All in all, these are well-crafted, interesting options and thus, my final verdict will clock in at 5 stars. The latest offering of Super Genius Games‘ Anachronistic Adventurers-line is 19 pages long, 2/3 of a page front cover, 1 page SRD/editorial, leaving us with 17 1/3 pages of content, so let’s check this out! Mechanics-wise, the Luminary-class provides us with d8 HD, 5+Int skills per level, 3/4 BAB-progression, good will-saves, proficiency with simple weapons and those according to progress level and of course, the Anachronistic Adventurer-line’s further modifications via archetypes, but before I get to them, let me first describe the Influence-ability: Luminaries, as manipulators and motivators, gain a pool of Cha-mod influence-uses per day that increases by 1 at 5th level and once every 4 levels thereafter. Creatures too dumb Int<2 are not affected. Luminaries may prompt rerolls from opponents, grant increasingly useful action types (first swift actions or +1 AoO, later even move actions and standard actions), allow allies to reroll select rolls and distract others with their charms if they fail a save. Neat abilities! Furthermore, they get so-called luminary-talents at 3rd level and every 4 levels thereafter and may select from a pool of them that mostly can be considered rather complex, allowing luminaries to e.g prompt a catharsis of multiple emotions, extrude an aura of calmness that allows allies better skill checks and even taking 10, gain additional class skills or bonus feats, discern the motivations of others and even convince others to not use a certain weapon for some time by laughing at an enemy’s choice of armament etc. They also gain an array of limited talents which have a more limited selection as well as a superbly love/help-at-first-sight capstone ability. As with all Anachronistic Adventurers-pdfs, we also get modular archetypes for the class, the Celebrity gaining 6 additional talents to choose from that include making “frenemies” (BOY I hate this word! ), working a crowd and rumor mongering. Headliners gain more class skills, bonuses to perform and 7 exclusive talents (including stage magic and animal companions). The Fixer gains better contacts for fewer bucks, better chances of finding an item, the option to talk down violence and access to talents from other Anachronistic Adventurers classes as well as rogue talents. Now additional system-wise, the pdf also has a neat idea and presents us mechanics to run diplomacy versus groups and tracking a group’s general response towards presented ideas, including time based on settlement sizes and DC-modifiers as well as rules for cheering, debating and heckling of ideas in public spaces/group relations. Above and beyond that, we also get advice on different ways of getting the attention of such significant groups. As with all pdfs of the series, we also get information on progress levels and proficiencies. Editing and formatting are top-notch, I didn’t notice any glitches. Layout adheres to SGG’s 3-column standard and the pdf’s stock art is very appropriate of the theme. The pdf unfortunately has no bookmarks, which is a major flaw by now in my book. The Luminary continues the trend of SGG’s excellent, top-notch Anachronistic Adventurers-line with yet another stellar, interesting class that provides options galore – though, for the first time, I am not at all sold on the additional mechanics provided. While the rules for influencing large bodies of people per se are well-written and concise, they also suffer from a lack of space devoted to them – a topic as complex as social interaction would in my opinion demand a more complex, more extensive system to allow for political machinations. That being said, unless you’re like me and feature oftentimes extremely complex political debates (I’ve crafted my own system for this, based loosely on Dynasties & Demagogues social combat), you should still consider the system enough to represent your needs. While for me the system falls flat of e.g. the research-system for the Investigator, I can’t hold this solely against this pdf. Since the talents etc. and the class are balanced, I’ll still stick to a top verdict, clocking in at 4.5 stars, rounded up to 5 for the purpose of this platform due to aforementioned personal preference of a more complex take on social interactions with groups and the lack of bookmarks.